One question that I'm sometimes asked by our customers is, how do you come up with the designs and names for ProtoSphere's default avatars? It's a great question. Here's how our avatars are born. Usually, one of our artists from the creative team is assigned with coming up with the "look" of the pre-defined set of selectable avatars, based upon the various body parts and selections that our other character artists have created and added to the build. They typically follow a business casual approach when setting up the wardrobe options and will joke that they try to make them look as "J.Crew" as possible. As for naming, it's not uncommon to see a baby name book laying around, used to come up with names for the various ethnicities. We try to be as diverse as we can, of course. We offer these default avatars to give users quick access to a variety of pre-defined choices. It's a time saver. 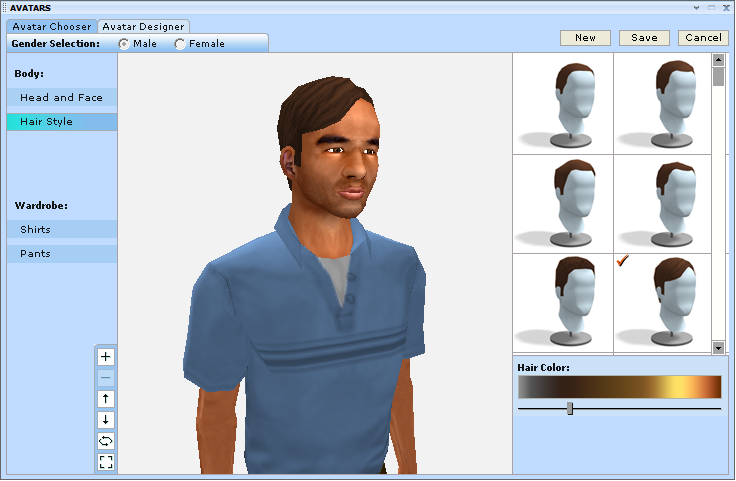 But ultimately, the fun is most had when users design their own character with the different heads, hair styles, shirts, and pants we offer. There are hundreds of possible combinations. ProtoSphere's avatar customization dashboard. It's you -- only virtual. In our next ProtoSphere release, we've worked to improve the system and quality of art. For example, instead of a particular male avatar head being able to support three or four different hair styles that fit that particular mesh, you'll be able to select any one of up to 20 hair styles to use on any male avatar head. This greatly increases the customization of the system, giving users more flexibility to make their avatars look as they wish, all within the "business appropriate" confines that we've established in the platform. This weekend I'll be packing my bags for Vegas. But gambling isn't in the cards (I say that now! Ha!). The real reason for my trip is to attend the WinConnections conference, which runs next Monday through Thursday. For the unacquainted, WinConnections is a premiere event for IT professionals. Three conferences will be taking place simultaneously -- Windows Connections, Exchange Connections, and SharePoint Connections. Each features a great line up of speakers and sessions, which you can read about on the WinConnections site. It's a valuable networking and educational conference, and a great opportunity to meet with peers, Microsoft product teams, and Microsoft partners. Our Sales Engineer Tom and I will be manning our booth at the event. So if you're planning on going to the show and want to catch up or learn more about ProtoSphere, be sure to stop by! In fact, we'll be giving a sneak peek into the new features for Microsoft customers attending the event. We'll also have free USB flash drives on hand to give out, which contain our ProtoSphere demo build and other information about the platform and how organizations are collaborating in it. I'll have my camera with me to capture the sights and sounds of the event, and hopefully snap some video interviews with the speakers and attendees. We'll bring back our coverage right here on our blog, so keep your eyes peeled. We've put together a new white paper for life sciences trainers to help them better understand how they can use virtual immersive environments to provide more effective training programs to their organization in less time and for less cost. 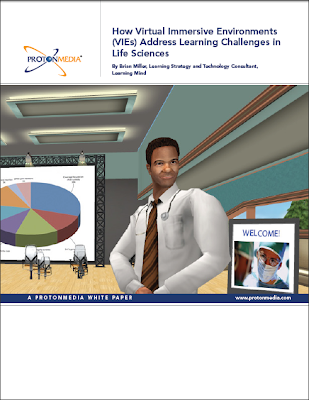 "How Virtual Immersive Environments (VIEs) Address Learning Challenges in Life Sciences" is packed with specific, detailed scenarios of how trainers can use VIEs to hold key opinion leader meetings, conduct scientific poster sessions, share clinical study research, and more. It's penned by Brian Miller, Learning Strategy and Technology Consultant for Learning Mind. Brian has worked in the corporate learning and development industry for 17 years, nine of which he spent in pharmaceuticals. He's held a range of roles through his career, including trainer, instructional designer, e-learning developer, project manager, senior-level learning manager, and strategic consultant. Through the scenarios he paints in his white paper, Brian underscores how virtual immersive environments can help trainers improve knowledge sharing, knowledge retention, and real-time collaboration. It's worth a read for anyone interested in gaining a grasp of the benefits virtual immersive environments can bring to not only life sciences companies, but many other enterprises as well. You can download it for free now. And if you have questions or feedback, feel free to leave a comment below. Much has been discussed and written about virtual environments achieving levels of immersion and interactivity that rival (and some believe exceed) face-to-face meetings. Much has also been written about increasing the retention of information shared in world. But to many, the whys and hows surrounding this remain a mystery. Perhaps the most crucial, yet most misunderstood element driving such a high degree of engagement is the avatar. 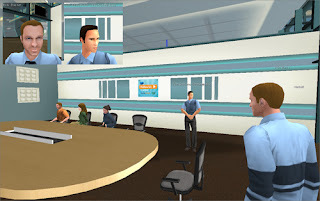 An avatar projects individuals in the first person, allowing them to enter a common environment -- a conference room, classroom, etc. -- with other people and data sources. This achieves common presence, togetherness, and equality, enabling a high degree of interaction and sharing to occur. It creates an any (person) to any (person or content) to any (time) scheme that is fundamental to highly interactive and productive encounters. Contrast this approach to the typical Web conferencing session that we have all endured. Each individual remains in their own separate and unique setting. It could be their office, home, hotel room, airport, or local coffee shop. And they stay there by themselves. By its very construct, Web conferencing is based on a scheme of broadcast -- one person controlling and presenting to a group of dispersed individuals. Is that interaction? Is that equality of function? Or is that a one-person, hierarchical approach to collaboration? This achieves a very interesting and counterproductive result. By limiting or preventing participants from dynamically interacting, sharing ideas, accessing content, and equally contributing to the task(s) at hand, traditional Web conferencing reinforces the sense of fragmentation and disconnection. Perhaps that is the key reason why a one (desktop) to many (participants) dynamic quickly leads to participant tune-out. It might sound a little goofy, but your avatar is your key to equality. It provides you the freedom to engage and contribute when and how you choose. Against this backdrop, it becomes clear that avatars are perhaps the most important human factor in virtual immersive environments. By dynamically connecting the right people to the right content at the right time, avatars enable the types of unrestricted interactions we all demand when tasked with contributing to a group initiative. What do you think, and what's been your experience? How essential are avatars to real online collaboration? My camera and I caught up with Mark Gribman, Education Manager for IBM, last night at the ASTD Greater Philadelphia Chapter meeting. Mark gave me a quick synopsis of how IBM has been working with virtual immersive environments lately, and why the company continues its commitment to education technology. Last night was the October meeting of the ASTD Greater Philadelphia Chapter (American Society for Training and Development). There was a great turnout of local learning and training folks, and I got the opportunity to spend time with some old friends and make new ones. My buddy Karl Kapp, who presented with me, recapped the meeting well on his blog. And to his post I'll add some coverage of my own. I snagged Dave Fink, Vice President of Programs of the ASTD Philly chapter, for a few minutes to talk about the organization and the businesses involved in making it tick. Watch it here, and don't go far, because I have another video from the meeting to share with you shortly as well! This Wednesday I'll be taking the stage for my next great performance. Unfortunately I'll be leaving my guitar at home. This stint is for my day job! I'll be presenting at the October meeting of the Greater Philadelphia Chapter of ASTD (American Society for Training and Development). For the unacquainted, ASTD is the world's largest professional association for the training and development industry. I'm honored to have several industry thought leaders with me at the podium this week. Wain Ballard, President of Ballard Education. Wain is very proficient in enterprise learning strategy and technology, having spent about 20 years in education, IT consulting, and banking/finance. We asked him if he would contribute a guest post for us about what he'll be covering, and we're hoping to share that with you soon. Dr. Lia DiBello, President and Director of Research for Workplace Technologies Research, located at City University of New York. She's spent over 18 years in workplace research at organizations including Harvard, IBM Cognitive Science Labs, and the Laboratory for Cognitive Studies of Work. Dr. Karl Kapp, Bloomsberg University professor whom we know and love. Dr. Tony O'Driscoll, Duke University professor and also close bud, who will be joining us virtually in ProtoSphere. The topic of the meeting is the business value of 3-D immersive environments for enterprise learning and collaboration. We'll be taking a look at the present and future of virtual world technologies and their use for learning and collaboration. You'll gain insight into how and why some companies are using virtual worlds today, and advice on deciding when, where, and how to use virtual worlds for enterprise learning in your organization. It will be an informative, educational event, and a good opportunity to bounce ideas off of us and your peers. The meeting will be held Oct. 13 from 6 p.m to 8:30 p.m. at the Hilton Garden Inn in Center City Philadelphia. For those of you who are out of the area or can't make it, I'm planning to bring my camera to capture the goings-on. We'll post the footage to our blog, so keep your eyes peeled. Hey, if I can't bring my guitar, I guess a camera will have to do!! You might be familiar with Microsoft's Pinpoint site, the company's portal of information about its partners' technologies and services. 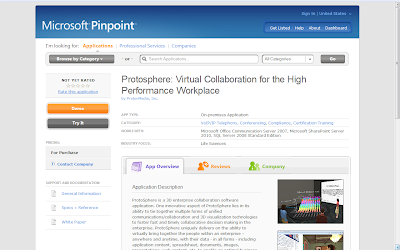 Microsoft recently added a page about ProtoSphere to Pinpoint, which includes a host of information and supporting materials about the platform. I thought I'd bring it to your attention as another educational resource. Feel free to poke around, download the demo, and get acquainted!